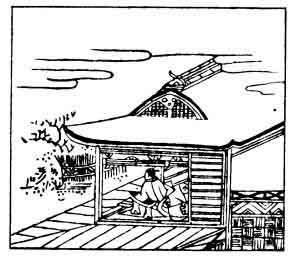 This writer was another of the great Fujiwara family, and died in the year 1206. The word kirigirisu, a cricket, is supposed to represent its song; the Japanese say that the chirping of crickets means cold weather. In the picture the poet is sitting up in bed with his arm on his pillow, listening to the crickets; and in the original illustrated edition underneath the verse is drawn a cricket hiding in the grass.